Home / Skydive Atlanta – Georgia on Adrenaline! Whether you are new or experienced, skydiving in Atlanta is one of the best places to enjoy this awesome activity. The four Atlanta skydiving drop zones are within 50 miles of the city center all provide a thrilling experience to any skill level. You can also enjoy the same thrilling experience through Atlanta indoor skydiving facilities without the heights. Whichever your choose, both Atlanta indoor skydiving and traditional skydiving centers will quench your thrust for adrenaline pumping thrill. Step 1: Check Groupon for Atlanta and Georgia Skydiving Discounts up to 90% off! 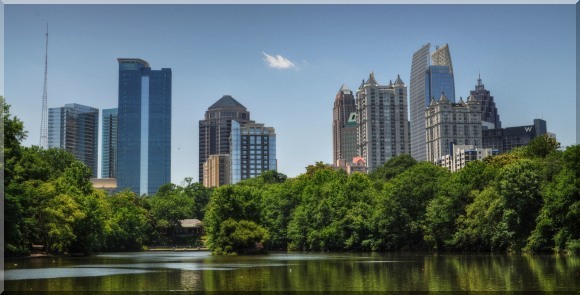 While you’re in Atlanta, consider the countless other tourist attractions. Some people come to visit the Martin Luther King Jr. national historic site or other historical places. Many tourists come to visit the city’s famous grand aquarium, the imposing Stone Mountain, or tour the Coca Cola headquarters. Besides the impressive city skylines, Georgia is blessed with rich flora and fauna. The foothills of the Appalachian Mountains, with flowering shrubs of colorful azaleas and dogwoods, offer eye catching scenery to hikers as well as anyone who chooses to skydive Atlanta. Tandem skydiving in Atlanta is suited for novice skydivers and provides the services of a trained instructor who will be attached to you during the entire jump. The two main companies that are offering tandem skydiving include the Atlanta Skydiving Center and Skydive Atlanta. The Atlanta Skydiving Center offers approximately a minute of free fall and nine minutes for the parachute ride for their jumps. On the other hand, Skydive Atlanta takes their skydivers to 14,000 feet to provide one minute of free fall and seven minutes for the parachute ride. Due to cost and availability, AFF certificed and advanced skydivers usually prefer solo freefall rather than tandem jumping. Both Skydive Atlanta and ASC both provide freefall training (AFF) and certification for solo jumping, and offer services for solo freefall jumps at their dropzones. Atlanta indoor skydiving provides a great approach to introduce skydiving to new jumpers and also provides a platform for experienced skydivers to practice. According to the policy of the companies, children 10 years and older can enjoy indoor skydiving in Atlanta, whereas, as in the United States, it is illegal for anyone under 18 to participate in real skydiving. Floating in the wind tunnels at Atlanta indoor skydiving facilities offer almost the same freefall experience as a traditional jump. 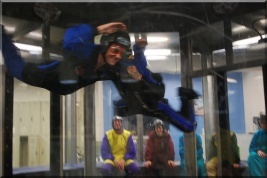 These powerful wind machines at Atlanta indoor skydiving centers can give their skydivers a lift of almost 90 feet. With the proper precautions, skydiving remains a thrilling yet safe adventure sport. Jump instructors ensure that all security precautions have been taken care of when beginners prepare for jumping, but you should always review the safety record before choosing the services of any skydiving company. Both the above-mentioned companies operating in Atlanta give due priority to safety and are some of the best in the sport. The reputation of Skydive Atlanta remains flawless as the company has a track record spanning over 26 years. Besides being a member of the U.S. Parachute Association, Skydive Atlanta is the only facility certified by the United States Department of Defense for military paratroopers in the state. The Atlanta Skydiving Center also has a proven track record, and experienced instructors and staff with decades of experience and use state of art equipment. The aircraft of this Atlanta skydiving company are also used for stunt pilots and the drop zone has even been chosen by the National Skydiving League as a site to organize the Eastern National Skydiving Championships. If you are bored with your 9 to 5 work week routine and want to find an exciting activity to pump your adrenaline once and a while, don’t wait… Find a good drop zone and Skydive over Atlanta, Georgia. Besides the city, the ‘Peach State’ as a whole offers perfect skydiving weather across the southern and middle regions with its moderate temperate climate. Even during the winter months the southern areas of Georgia hardly get any snow as the region lies below the Piedmont line, and this makes Skydiving in Atlanta a perfect choice, even in winter.